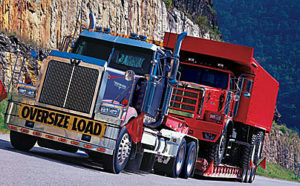 Thousands of heavy haul trucks and trailers across the US and Canada. We are a trucking company that has a variety of trailers we use to get your freight moved. When it comes to trucking we know the business. We have access to literally thousands of trucks across the US and Canada. This allows us to get your freight moved not only in a timely manner but at a lower cost to you. Don’t be deceived by other trucking companies, our freight professionals have over 200 years of combined experience in trucking. Heavy Hauling Quote has been an industry leader in flatbed trucking and continues to expand its network of trucks. • We offer competitive rates and have the experience and access to get you what you need. • You work with a specialist from start to finish. • We follow your load closely and make sure that it is picked up and delivered safely and on time. 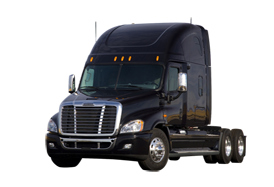 • We have access to 1000's of trucks across the US and Canada. • We do this every day and take out the headache and stress of getting your freight moved. Flatbeds are one of the most widely used trailers due to their versatility. You can load from the top, sides, or rear of the trailer making it a key asset to the flatbed trucking industry. This trailer accommodates freight with the maximum legal weight and dimensions shown below. Step Deck Trailers also known as drop deck trailers. They are simply flatbed trailers with a top and bottom deck. They are designed to haul freight that cannot be transported on a standard flatbed, usually due to height restrictions. This trailer accommodates freight with the maximum legal weight and dimensions shown below. Also known as flatbed stretch trailers. 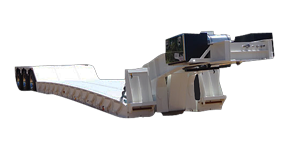 They are designed for loads that are too long to haul on a standard flatbed trailer, and that need the support of the trailer so there is no overhang. This trailer accommodates freight with the maximum legal weight and dimensions shown below. Extendable drop decks are designed for loads that are too long to haul on a standard step deck, and that need the support of the trailer so there is no overhang. They are also designed to haul freight that cannot be transported on a standard step deck. This is usually due to length restrictions. This trailer accommodates freight with the maximum legal weight and dimensions shown below. Double drops are used mainly for oversized freight. The lower deck height lets you load products that are taller than 10′ tall. It has a longer piece of the trailer in the middle that we like to call the “well” and then a front and back deck of the trailer also. The “well” usually ranges from 25-29′. Removable Gooseneck (RGN) trailers give you the opportunity to move those same tall products, but also give you the ability to load large pieces of equipment onto the trailer by driving them on. With this trailer, the front of the trailer is detachable, which allows the trailer to drop to the ground and create its own ramp. These types of trailers can be designed to haul up and over 150,000lbs worth of equipment. RGNs can go from a 3 axle RGN to as large as you want, the more axles the heavier the shipment can weigh. Heavy haul trailers like these are more specialized than some of the other trailer types and make them more expensive to use. This trailer accommodates freight with the maximum legal weight and dimensions shown below. Stretch RGN’s are designed for loads that are too long to haul on a standard RGN trailer. Stretch RGN’s range from 3 axels, and up depending on freight weight. The more axles on the trailer, the heavier the shipment can be. Some loads require specialized trailers. This is especially true for oversized and over dimensional pieces that simply will not fit any other standard trailers. These pieces have specialized trailers designed for them. Examples of specialized trailer include perimeter trailers, Schnabel trailers, and dolly trailers. Power only units tow many different types of trailers depending on hitch hookup. Trailers have a 5th wheel hitch, ball and hitch, or a pintle hitch equipment. A standard rig usually has 3 axels. Often a 4-axle truck is needed if the freight and trailer are overweight. Wide Open -State requirements must be followed.